Why can’t we Remake the Rocketdyne F-1 Engine, which took humans to the Moon? The mighty Saturn V, the rocket that took humans to the moon, remains the tallest, heaviest, and most powerful rocket ever brought to operational status (as of 2018). It was used by NASA between 1967 and 1973. It was powered by five Rocketdyne F-1 engines. With a thrust of 1,746,000 lbf (7,770 kN) in vacuum (1,522,000 lbf / 6,770 kN at sea level), the F-1 remains the most powerful single combustion chamber liquid-propellant rocket engine ever developed. Today, private companies like SpaceX, Blue Origin, and space agencies like NASA trying to build powerful rockets in order to reach Moon and Mars. But, we’ve already built a rocket which took us to the moon, why don’t we simply remake it (and the engines)? In the video below, Youtube user Curious Droid answers this question. When NASA was looking for a very large engine for the SLS boosters some of its engineers looked at resurrecting the Rocketdyne F-1 engines but what they found out might well surprise some people and just goes to show how things have moved on since the 1960’s. The ultra-talented and experienced engineers who built the F11 engine were retired or long dead – and some of the crucial knowledge, skills, and experience were long gone with them. Many of those skills and techniques which was used to build F-1 engines are no longer in use. So we simply don’t have the people and skills that can make them in the same way anymore. With the help of powerful computers and new technologies, we can do a better job today (if we can find enough money to do that). With the examination of Rocketdyne F-1 engines from museums and storage, today’s engineers did discover enough to create new F-1B engine should it ever be built. Using modern computing modeling and manufacturing techniques, the new engine could not only be more efficient, it would be just as powerful as the updated but unflown F-1A at 1.8 million pounds of thrust. More importantly, it would reduce the number of the manufactured parts from around 5,600 to just 40! And while increasing its reliability and decreasing costs in the process. I would recommend you to subscribe to Curious Droid’s channel if you haven’t already. 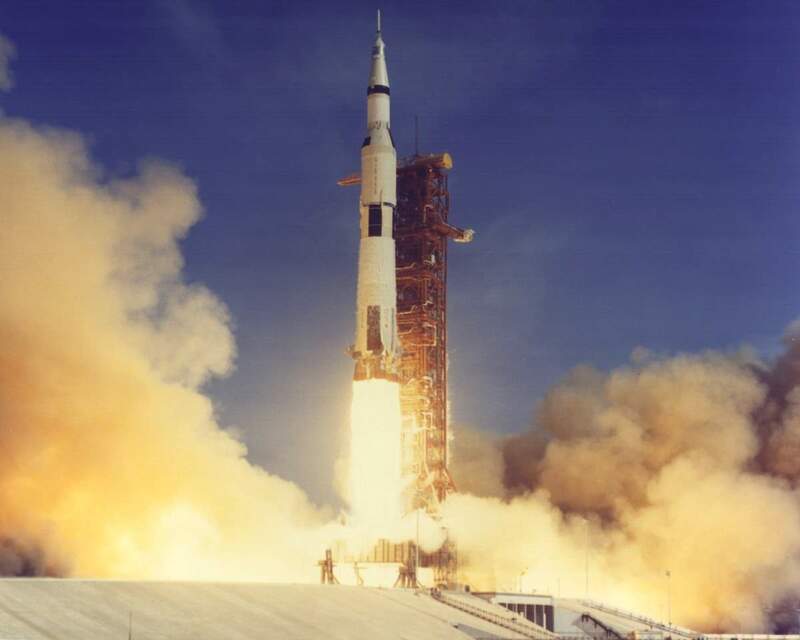 The Apollo 11 mission, the first manned lunar mission, launched from the Kennedy Space Center, Florida via the Marshall Space Flight Center (MSFC) developed Saturn V launch vehicle on July 16, 1969, and safely returned to Earth on July 24, 1969. The Saturn V vehicle produced a holocaust of flames as it rose from its pad at Launch complex 39. The 363 foot tall, 6,400,000 pound (2,902,991 kg) rocket hurled the spacecraft into Earth parking orbit and then placed it on the trajectory to the moon for the humanity’s first lunar landing. Aboard the space craft were astronauts Neil A. Armstrong, commander; Michael Collins, Command Module pilot; and Edwin E. Aldrin Jr., Lunar Module pilot. With the success of Apollo 11, the national objective to land humans on the Moon and return them safely to Earth had been accomplished. 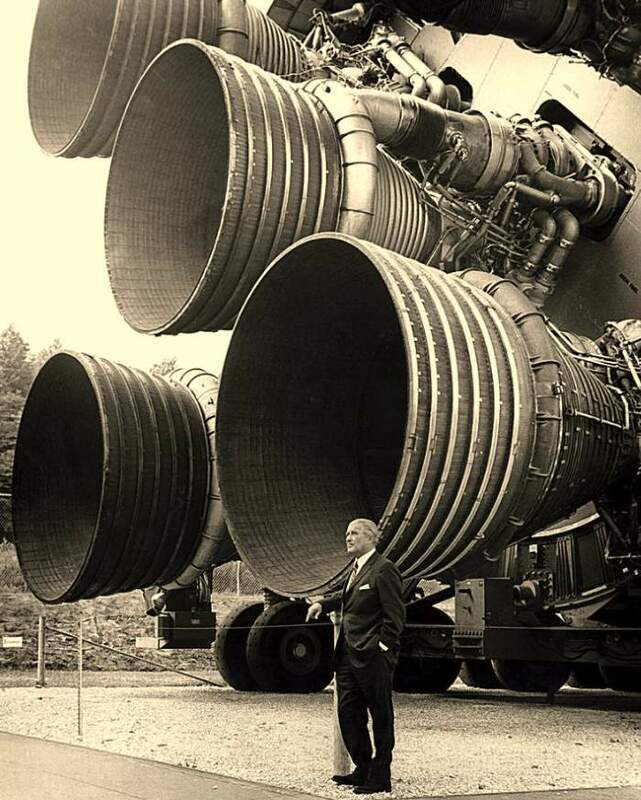 In the image above, German (and, later, American) aerospace engineer and space architect Dr. Wernher von Braun (March 23, 1912 – June 16, 1977) standing by five F-1 Engines. A pioneer of America’s space program, Dr. von Braun stands by the five F-1 engines of the Saturn V Dynamic Test Vehicle on display at the U.S. Space & Rocket Center in Huntsville, Alabama. Designed and developed by Rocketdyne under the direction of the Marshall Space Flight Center, a cluster of five F-1 engines was mounted on the Saturn V S-IC (first) stage. The engines measured 19-feet (5.8 meters) tall by 12.5-feet (3.8 meters) at the nozzle exit and burned 15 tons of liquid oxygen and kerosene each second to produce 7,500,000 pounds of thrust. The S-IC stage is the first stage, or booster, of a 364-foot long (110.9 meters) rocket that ultimately took astronauts to the Moon. The F-1 engine had roots outside NASA, born as an Air Force program developed by the aerospace firm Rocketdyne in 1955. NASA inherited it during a transfer of projects, conducted its own feasibility studies and awarded Rocketdyne a follow-on contract to step up work on the gargantuan propulsion system not long after NASA’s formation, in 1960. Each second, a single Rocketdyne F-1 engine burned 5,683 pounds (2,578 kg) of oxidizer and fuel: 3,945 lb (1,789 kg) of liquid oxygen and 1,738 lb (788 kg) of RP-1, generating 1,500,000 lbf (6.7 MN; 680 tf) of thrust. This equated to a flow rate of 671.4 US gal (2,542 l) per second; 413.5 US gal (1,565 l) of LOX and 257.9 US gal (976 l) of RP-1. During their two and a half minutes of operation, the five F-1s propelled the Saturn V vehicle to a height of 42 miles (222,000 ft; 68 km) and a speed of 6,164 mph (9,920 km/h). The combined flow rate of the five F-1s in the Saturn V was 3,357 US gal (12,710 l) per second, or 28,415 lb (12,890 kg). Each Rocketdyne F-1 engine had more thrust than three Space Shuttle Main Engines combined. The engine was designed to the human-rated safety concept, which requires that it be dynamically stable. If any of the engine’s systems are disturbed from any source, the system must automatically overcome the disturbance and return to stable operation. To prove the F-1’s ability to stabilize, a method for creating artificial disturbance was introduced by detonating a bomb inside the combustion chamber near the injector face. Different injector designs were evaluated according to their ability to recover quickly from such disturbances. The result is an injector design in the present production configuration of the F-1 engine that has proved to be very quickly self-stabilizing in response to induced disturbances. A Saturn V rocket at NASA’s Lyndon B. Johnson Space Center. The rocket has arrived in the park in 1977. Its restoration began in March 2004 and took two years to complete. Space Center Houston takes you up close and personal with this amazing artifact of space history through our NASA Tram Tour. Previous PostWatch: what other stars would look like in the place of the SunNext PostCan global warming be held culpable for wildfires? Thanks for the comment and the link! Ars Technica is one of my favorite sites. You’re right, and Curious Droid also mentioned about that new engine in the video above (see after 3:45).